Successfully Added Lenovo K3 Smartphone - Quad Core CPU, Adreno GPU, Android OS, 5 Inch HD Screen, 4G Dual SIM (White) to your Shopping Cart. This powerful smartphone is guaranteed to offer satisfying user experiences for a low price. With a quad-core 1.2GHz processor the Lenovo K3 gives its users the power to experience apps, videos, web-browsing, and photo capturing a whole lot faster. Along with its large 5 Inch 1280x720 HD display this phone will guarantee to take your user experience to the next level. With Google Play installed on each of Lenovo’s K3 Smartphone’s the user has millions of Apps, video’s, and games at their disposal, enabling them to take the most out of this phone no matter where one’s interests lay. Equipped with a removable 2300mAh battery the K3 Smartphone has a battery life that ranges between up to 8 hours when used constantly to 72 when in standby. The battery itself has a charging time of barely 2 hours, enabling one to rapidly charge their phone to ensure a minimum loss of time. 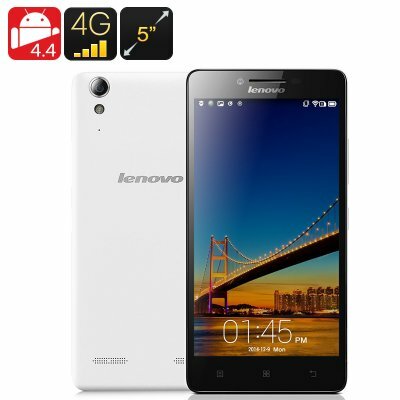 Lenovo’s K3 Smartphone holds the possibility to insert two SIM-Cards enabling the user to switch between different SIM suppliers or networks without having to remove the battery. With its 4G connection this phone offers download speeds up to 150Mbps. Its fast connection along with the phone’s 16GB internal memory and 32 external memory gives the user the possibility to enjoy all his apps, video’s, games, and web-activities to the most: truly creating a next-level experience. The Lenovo K3 Smartphone comes with a 12 months warranty, brought to you by the leader in electronic devices as well as wholesale Android smartphones..